Thursday, in response to the uproar created when she lip synched the national anthem at President Obama’s inauguration, Beyonce held a press conference and sang the anthem live, without any music behind her, flawlessly. 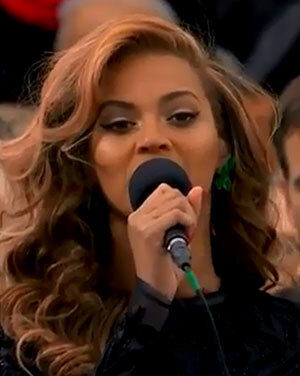 We already knew Beyonce was capable of singing the anthem. She’s got an amazing voice, and she’s sung live many times over the years. So her anthem stunt was completely pointless. If anything, it only served to reinforce why so many of us were disappointed with Beyonce’s lip synching in the first place. It’s because she doesn’t need to lip synch. She’s too good for that. The good news is that now we can expect Beyonce to bend over backwards to avoid lip synching during her Super Bowl halftime performance. Hopefully the same will apply to her Destiny’s Child bandmates if they join her on stage, since they’ve been known to sing to backing tracks in the past. And for the record, we love Beyonce. When she sings live, at least.